IndiaFilings offers a comprehensive business accounting and income tax return filing service for proprietorships starting from Rs.5899/- per year. 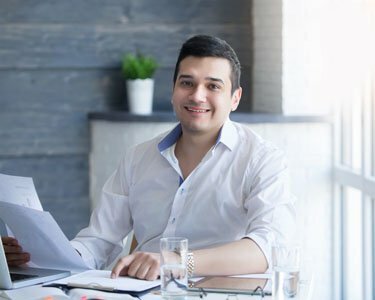 IndiaFilings is the market leader in company registration services in India, offering a variety of company registration like private limited company registration, one person company registration, Nidhi Company Registration, Section 8 Company Registration , Producer Company Registration and Indian Subsidiary registration. The average time taken to complete a proprietorship registration is 3 - 5 working days, subject to government processing time and client document submission. Get a free consultation for proprietorship registration and business setup in India by scheduling an appointment with an IndiaFilings Advisor. Procedure and documents requried for starting a proprietorship in India. A sole proprietorship is one of the most common form of business in India. Any Indian citizen can easily start a proprietorship. Sole proprietorship is the most widespread form of business ownership in the world. As the name suggests, it is a kind of business in which a single person is vested with the ownership of the assets and affairs of the business. In this article, we look at the advantages and disadvantages of a proprietorship firm. Procedure for conversion of proprietorship into private limited company. Private limited company offers significant advantages over the proprietorship firm. Procedure for opening sole proprietorship bank account. The Reserve Bank of India has laid out Know Your Customer (KYC) norms for opening of current account in the name of a sole proprietorship along with the list of documents required. Under Income Tax Act, all proprietors below the age of 60 years are required to file income tax return if total income exceeds Rs. 2.5 lakhs. The income tax rate for proprietorship is slab based starting from 10% for income between Rs.2.5 lakhs to Rs.5 lakhs. File income tax return of proprietorship firm online with Expert help. Proprietorship firms are required to file tax return each financial year if taxable income exceed Rs.2.5 lakhs. IndiaFilings provides accounting and tax return filing services to help proprietorships file tax returns. Premium LEDGERS Accounting Software with GST Portal Integration and eWay Bill Software. The Reserve Bank of India has laid out Know Your Customer (KYC) norms for opening of current account in the name of a sole proprietorship and all Banks have procedure to open sole proprietorship current account in business name. GST registration is required in most banks to open a current account or business account for a proprietorship.